Just how strict are NYC coop house rules? How much power does a co-op board really have? We’ll answer these questions and more in this article. Are NYC Co-op House Rules more strict than Condo House Rules? Not necessarily. Condo House Rules are also created by the condo’s elected board of directors and can be equally strict. In practice however, NYC co-op house rules tend to be much more peculiar and strict than their condo counter-parts. This is undoubtedly influenced by the dramatically greater amount of power that a co-op board has over its shareholders vs a condo board over its owners. Remember that a co-op shareholder does not own real property. The entire building is the property of the cooperative corporation and the shareholder merely has a “proprietary lease” allowing him or her to occupy a specific apartment in the building. 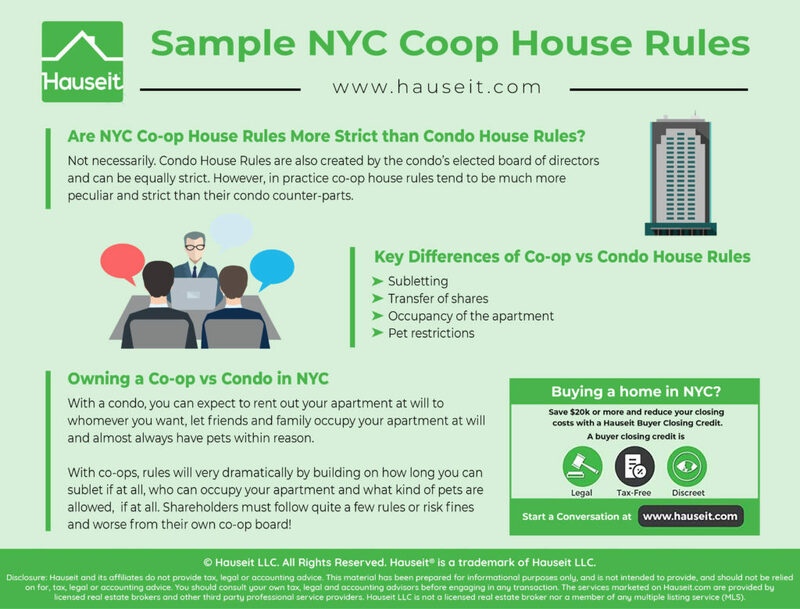 As a result, NYC coop house rules often dictate a resident’s life even within his or her apartment much more so than an equivalent condo owner. What do sample NYC coop House Rules look like? You’ll notice several key differences versus the House Rules of a typical condominium. They are subletting, transfer of shares, occupancy of the apartment and pets. With a condo, you can expect to rent out your apartment at will to whomever you want, let friends and family occupy your apartment at will and almost always have pets within reason. With co-ops, rules will very dramatically by building on how long you can sublet if at all, who can occupy your apartment and what kind of pets are allowed, if at all. Moreover, transferring shares (i.e. selling your apartment) in a co-op is substantially more onerous versus selling a condo where you no not need to ask permission. The buyer of your co-op will need to submit a highly intrusive purchase application to be approved by the board. After that, they’ll still need to meet the board and pass an interview before they will be approved! 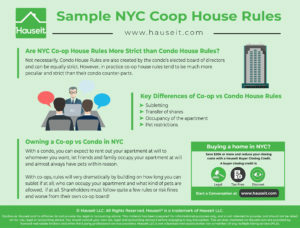 As you can see from the sample NYC coop house rules below, shareholders must follow quite a few rules or risk fines and worse from their own co-op board! What an antiquated form of living! Any reference to Shareholders used herein includes shareholders, residents, subtenants, commercial tenants, guests, and staff members. Please be advised that any violation of these House Rules constitutes a default under the Proprietary Lease and/or may subject the violator to monetary penalties. 1. Public hallways and stairwells must be kept free and clear of personal objects, such as bicycles, skates, strollers, doormats, umbrellas, boots, etc. When away for a period of time exceeding one (1) day, newspaper delivery services should be suspended. 2. No patient of any doctor who has offices in the building is permitted to wait in the Lobby. 3. Children may not play in the Lobby, public hallways, stairwells or elevators and are not permitted on the roof deck or rear garden unless accompanied by a responsible adult. 4. Loitering or soliciting is not allowed anywhere in or adjacent to the building and should be immediately reported to the doormen in order to apprehend a possible intruder. Door-to-door or under-the-door solicitation by outsiders, Shareholders or their guests is not permitted. This includes, but is not limited to, those who may be involved in political campaigns, fund-raising or the sale of products or services. 5. Nothing may be placed in any window or other part of the building or attached to, or hung from, the exterior of the building. This includes, but is not limited to, signs, notices, advertisements, illuminations, external antennas or satellite dishes and airconditioners. 6. Nothing may be shaken, hung or thrown from the windows, terraces, balconies or doors. (Be sure your cleaning help abides by this rule). Objects projecting from windows are not permitted. Plants may not be placed on the outside windowsills or hung from terrace/balcony ceilings, nor may any unsecured planters be installed to protrude above or outside the railings. 7. Vehicles, including bicycles, luggage carts, and dollies must be transported in the service elevator unless the service elevator is out of service. 8. Eighty percent (80%) of each apartment’s floor area, except the kitchen, bathrooms, and closets, is to be carpeted, along with substantial under-padding, to reduce the noise to the apartment below. 9. Disturbing noises emanating from your apartment or in common areas, and any interference with the rights, comfort or convenience of other Shareholders are never allowed. Shareholders are required to respect the rights of neighbors by keeping noise from radios, TVs, stereos, parties, pets or musical instruments at a nondisturbing level at all times, but especially between the hours of 11:00 P.M. and 8:00 A.M.
10. No Open Houses are permitted at any time regardless of whether they are conducted by a Shareholder or a broker. No group tour or exhibition of any apartment or its contents may be conducted, nor may any auction or sale be held in any apartment. 11. Smoking is not permitted in the public areas within the building. 12. Skating and rollerblading are not permitted within the building. 13. By law, all apartments must have a working smoke detector and first floor units are required to have a carbon monoxide detector. 14. No clothes washer and/or dryer is/are permitted in an apartment without the prior approval of the Board. The Board reserves the right to require removal of any existing machines at its discretion. 1. Maintenance payments received after the tenth of the month will incur an administrative fee. 2. House keys will be given out by the doorman in accordance with the approved list provided by each Shareholder via [website].com. This is for your security and that of the doorman, other staff members and the Corporation. Shareholders are responsible for the keys to their mailboxes. If the keys are lost or the lock must be replaced for any reason, the Resident Manager will assist at the Shareholder’s expense. Mailboxes must be kept closed and locked at all times. 3. A current set of apartment keys is required to be kept in the key control system to facilitate access in the event of an emergency. 1. Deliveries, except food deliveries, must be received between 9:00 A.M. and 5:00 P.M. on weekdays, except holidays. All oversized deliveries must be made through the outside service entrance. Prior arrangements must be made with the Resident Manager at least 48 hours in advance to avoid conflicts with other deliveries. Unless authorized by the Resident Manager to accept the delivery into the building, the doorman will turn it away. A list of Building Holidays is posted in [website].com and in the office of the Resident Manager. 2. Messengers and trades people, including food deliverers, must use the service elevator. Contractors, movers and delivery companies must use the service entrance and elevator from the basement. 3. Small deliveries requiring one run of the service elevator may be permitted on Saturday from 10:00 A.M. to 5:00 P.M. The date and description of the item being delivered must be given to the Resident Manager in advance for scheduling. No Saturday delivery will be permitted in the building by the doorman unless he has received prior approval from the Resident Manager. The delivery may not be a major one and is not to be confused with a move in/move out which is never permitted on weekends. The service entrance must be used at all times. 4. Mail is delivered by the Post Office to boxes located off the rear lobby whereas packages, dry cleaning, etc. are held by the doorman in the front lower lobby. Shareholders will be notified of such deliveries via [website].com and/or on the monitor in the mailroom. All such deliveries should be picked up promptly, especially during the holiday season. 5. No deliveries of any hazardous items or any items intended for commercial use will be permitted. 6. The doorman will not be responsible for certified or registered mail, UPS, FedEx and other couriers, messenger deliveries, jewelry, furs or other valuables. Such accommodation is at the sole risk of the Shareholder. 7. The Corporation and/or its employees are not responsible for mail, packages or other objects entrusted to the doormen by Shareholders, postal workers, UPS or any other entity. 1. A Work Order must be completed to have repairs made in an apartment by the building staff. Work Orders may be placed through [website].com or the doorman. 2. Shareholders are not charged for repairs that are the responsibility of the Corporation as described in the Proprietary Lease. If the repair is the responsibility of the Shareholder, the cost of parts and labor for repairs performed by staff members or outside contractors hired by the Corporation will be billed back accordingly on the Shareholder’s monthly maintenance bill. 3. It is recommended that unless it is an emergency, a written estimate be requested and there be complete understanding between the Shareholder and the Managing Agent as to who is responsible. 4. All built-ins are considered personal property. If repairs are to be performed on airconditioning units or inside walls blocked by built-ins, the Shareholder is responsible for the cost of the removal and replacement of built-ins. 5. Shareholders whose apartments have balconies, terraces or gardens are responsible for the upkeep and maintenance of those areas. 1. Staff members are not permitted to conduct private business during their building working hours. The Corporation is not responsible for the quality of the work or any damage that might be caused by staff members when hired privately during their off-hours. Outside contractor rules apply. 1. Written approval from the Managing Agent is required before an alteration may be made including, but not limited to: painting, carpet removal/installation, wallpapering, removal or installation of interior walls, pipes, wires, cabinets, doors, appliances, plumbing or electrical fixtures. Anyone planning renovations should contact the Managing Agent to request an Alteration Agreement or Light Work Agreement, which details the obligations of the Shareholder. The appropriate fees must be paid before approval is granted for the commencement of work. 2. All contractors and workers must receive prior permission from the Managing Agent to enter the building to perform work. All contractors and their workers must carry adequate insurance policies as delineated in the Alteration Agreement or Light Work Agreement. 3. Construction, installation, repair work and painting are allowed during weekdays between 9:00 A.M. and 5:00 P.M., except holidays. A list of Building Holidays is available on [website].com and in the office of the Resident Manager. 1. Recyclable materials must be separated by the Shareholder and placed in the proper receptacle in accordance with NYC procedure. Carefully review all wall signage concerning proper recycling procedures, as they are NYC regulated and subject to change. 2. Garbage (other than recyclable items) must be disposed of in bags down the compactor chute. A large garbage receptacle is supplied for oversized items (e.g., pizza boxes). Lighted matches, cigarettes or cigars must never be used or disposed of in this room. Additionally, carpet sweepings, oil and cleaning fluid soaked rags, any flammable, explosive or highly combustible substances should never be put down the chute. 3. Housekeeping help should be instructed of the proper garbage and recycling procedures. 4. Bulk items or extraordinary quantities of trash should not be left in the compactor room, basement or courtyard without the Resident Manager’s knowledge and approval. It is the responsibility of the Shareholder to make disposal arrangements. The Resident Manager may supervise the removal of these items from your apartment. 5. Corrugated cardboard boxes should be broken down and flattened by the Shareholder and placed neatly in the trash room. Large or oversized corrugated cardboard boxes (broken down, if possible) should be taken down to the basement and deposited near the compactor room door. 1. An application may be obtained from the Transfer Department of the Managing Agent. Once completed, the application is to be returned to the Transfer Department with the appropriate non-refundable fees. 2. The apartment must be occupied as the primary residence of the applicant. 3. Guarantors are not allowed on the Proprietary Lease. 4. Only first-degree adult relatives of the Shareholders (i.e., spouse, parent, grandparent, child, grandchild or sibling) may occupy the apartment in the absence of the Shareholder. In all other cases, the Shareholder must be present. 5. Transfers of shares will be subject to a payment to the Corporation equal to ten percent (10%) of the difference between the Shareholder’s original purchase price and the current selling price of the apartment, net of permissible deductions, in accordance with the Second Amendment to the Offering Plan. The Corporation shall supply to the Shareholder the required worksheet delineating the allowed deductions and computations for this payment. 6. Any transfers of shares to another existing Shareholder will be subject to a separate letter agreement regarding such transfers of shares. If the purpose of the transfer is to combine apartments, the combination must be completed within one year of the closing date of the transfer. The Board’s approval of the sale will be contingent upon the execution of said letter agreement. 7. Shareholder must be a primary resident for three consecutive years prior to each request to sublet. 8. Shareholders must request permission to sublet from the Board of Directors prior to obtaining a sublet application. Shareholders must submit a written request for approval for a renewal of the sublet. Once approval is obtained, an application may be obtained from the Managing Agent. Once completed, the application is to be returned to the Managing Agent with the appropriate non-refundable fees and deposits. 9. An interview of the prospective subtenant is required before final approval of the sublet is granted. 10. A sublet fee based upon a dollar allocation per share is collected immediately upon Board approval of the subtenant. No move-in is permitted until all fees are paid. The fee is collected for each year of the subtenancy. 11. Sublets are for a period of one year and may be renewed for a second year with Board approval. If a subtenant is approved for two consecutive years, a third year for that subtenant only may be requested. 12. No pets are permitted in a sublet apartment. 13. No smoking is permitted in a sublet apartment. 14. No guests are permitted to use a sublet apartment without the subtenant’s presence. 15. Unauthorized sublets will incur a penalty of twice the sublet fee then in effect. 16. 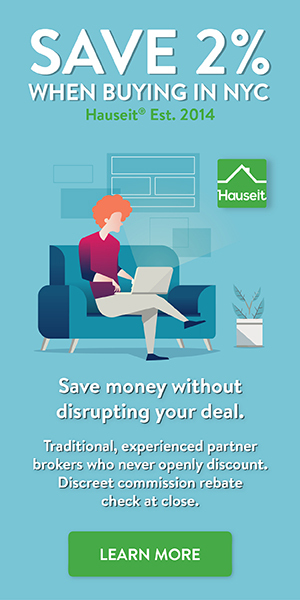 No apartment may be sublet without the approval of the Board of Directors, which may be withheld in the Board’s sole and absolute discretion. 17. A refinance application may be obtained from the Transfer Department of the Managing Agent. Once completed, the application is to be returned to the Transfer Department along with the appropriate non-refundable fees. 18. No more than 80% of the appraised value of any apartment may be financed and only recognized institutional lenders will be accepted by the Corporation. 1. Only one move-in or move-out may be scheduled by the Resident Manager on any given day. 2. Arrangements for moving in and out must be coordinated with the Resident Manager at least three days in advance. Moving companies must be properly insured and provide evidence of properly endorsed policies naming the Corporation and the Managing Agent as additional insureds with primary coverage. A security deposit and all move-in/move-out fees must be paid in advance of scheduling. During the move, floors and hallways must be protected by Masonite or similar boards provided by the moving company. These boards are also available from the Resident Manager. 3. All moves in or out of the building must be made between 9:00 A.M. and 5:00 P.M.
4. No moves are permitted on weekends or holidays. All refuse generated as a result of a move must be disposed of properly by movers and Shareholders. Packing cases and cartons are not to be left in the compactor room, basement, garden or sidewalk. Arrangements for bulk disposal must be made in advance with the Resident Manager. 5. It is suggested that you speak with the Resident Manager prior to any move-in or out of oversized pieces (e.g., a sofa) to determine if it will fit in the service elevator. It is also suggested that you inform your moving company of the required use of the service entrance. 1. Pets are not to make any disturbing noise that interferes with the rights and comfort of other Shareholders. 2. Pets must be transported in the service elevator or stairway. They are not allowed in the passenger elevator except in an emergency or if the service elevator is out of service. This is necessary to maintain the cleanliness of the passenger elevators and for the comfort of people who are allergic to, or afraid of, animals. 3. Dogs must be kept on leashes at all times within the building’s public areas. 4. No more than two dogs are permitted to reside in any apartment at any time. 5. Pets are not allowed on the roof, the rear garden or the basement. Owners must refrain from allowing their dogs to relieve themselves on the building, trees, planters or walls. Strict adherence to New York City’s “pet clean-up law” is required. 6. If a pet owner fails to adhere to the above guidelines regarding pets, the Board of Directors may require that the pet be removed from the building. 7. Shareholders are not to feed pigeons, birds or other animals from windowsills, balconies, terraces, the courtyard garden, roofs, sidewalks or street adjacent to the building. 8. Cat litter is not to be disposed of via plumbing facilities. Shareholders should take properly contained cat litter down to the basement and deposit near the compactor room door. 1. The garden and roof deck are open from 8 A.M. to 10 P.M.
2. All children under the age of 16 must be accompanied by a responsible adult. 3. Noise must be kept to a minimum to respect the rights of Shareholders who are using the space or live adjacent to the area. Therefore, no radios, music or musical instruments may be used without earphones. If furniture is moved, it should be picked up rather than dragged. 4. No pets are permitted in the garden or on the roof deck. 5. No skates, rollerblades, scooters, or other potential tripping hazards are permitted. 6. No ball playing, group exercise, or any other activity that may interfere with the quiet enjoyment of the garden or roof deck is permitted. 7. Any use of the common areas of the Corporation is done at the Shareholder’s own risk. 8. Shareholders are not permitted to walk on the unpaved, graveled surfaces of the roof. This will cause damage to the roof membrane and increase the potential of water leaks. 9. Shareholders who choose to smoke in the garden must use the ashtrays provided in the rear of the garden. No smoking is allowed on the 15th floor roof deck. 10. The 17th floor roof is always off limits. 11. Use of the courtyard garden or roof deck by a group of more than 15 people requires prior approval. Please contact the Managing Agent to make appropriate arrangements. Please note that approval does not provide for exclusive use of the space. These House Rules may be added to, amended or repealed at any time by resolution of the Board of Directors of the [address] Owners Corporation.